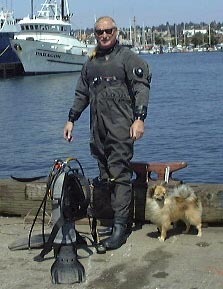 In 1982, Dwayne founded Emerald City Diving, Inc., a commercial diving company serving the central Seattle and surrounding community, focusing primarily on Lake Union, Lake Washington, and Edmonds. Emerald City specializes in underwater yacht maintenance, salvage, and recovery. Emerald City Diving offers propeller removal and installation, in the water thru-hull replacement and installation, in the water max-prop factory approved installations and repairs, boat bottom cleaning, changing zincs, salvaging boats up to 50' in length, lost item recovery, and treasure hunting for fun and profit. Dwayne first worked solo, but quickly has expanded his clientele and developed his business. He currently employs four commercial divers, all wearing only OS SYSTEMS drysuits. Dwayne started personally wearing OS SYSTEMS drysuits in May, 1984. By 1986, Dwayne had become the primary OS SYSTEMS' test diver. He personally dives between 500 to 1205 dives per year. The test drysuits are shared among all of his commercial divers, substantially accelerating the wear and tear potential. Dwayne's job is to "use and abuse 'em." "Because we wear OS, we do not spend all of our time in the shop, repairing and fixing our drysuits. This means we have the time to HAVE A LIFE." "Rubber seals do get torn and do wear out. NO PROBLEM!!! We can easily replace a neck seal and two wrist seals, on location, and in 1/2 hour, be back in the water, using the same drysuit. THIS IS JUST F…ING MAGIC!!" "We make money in the water, not in the shop fixing drysuits. As a commercial diver the dollars-to-dive costs are critical. Usually the drysuit costs are the highest. Using OS SYSTEMS drysuits brings the costs down to less than $.50/dive. I am making money now." "These photos show me wearing one of our test drysuits. We logged 4693 dives on this drysuit, from October, 1995 to September, 1999, before we had to retire it with a hero's burial." "Customers do not care if I am dry, but I do." "Knives, bullets, and spear guns punch holes in drysuits, even OS SYSTEMS drysuits. I use duct tape for emergency, instant patches. I have personally worn my drysuit with duct tape covering a 1" gash for 3 months, just to see how long it would hold. I got tired of waiting and finally removed the duct tape and patched the hole, which by the way takes about 2 minutes." OS SYSTEMS drysuits are suits for all seasons. We use OS shell drysuits and change the thickness of our undergarments to fit the water temperature." We can easily don our drysuits, from street clothes to water entry, w/full scuba gear in 4 minutes." "We also do want to look professional, clean and sharp, because we are working on expensive yachts. OS SYSTEMS drysuits look good." "I don't see why anyone would be diving in anything else."